My scalp is pretty much as smooth as a peach, but being the product junkie that I am, and as long as I have even a slight trace of a hair follicle on my head, I will be buying shampoo. The one that's been rocking my world lately and doing double-duty is Neutrogena Invigorating Hair & Body Wash. Who knew you could use one product head-to-toe? Who knew? This fresh, rich lather cleans your hair thoroughly without over-drying. As a body wash, the invigorating scent refreshes and leaves your skin feeling healthy and clean. This one smells great! Bonus points: NIH&BW boasts a recession-friendly price of $5 and change...Yay! 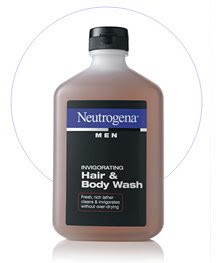 Plus, the new packaging of Neutrogena men's line is very masculine and appealing and looks good in the bathroom.